Even though the military conflict in Ukraine is not making big headlines, it is still ongoing. Soldiers and civilians continue to die and the Minsk agreement is broken constantly. With over 10 000 deaths, and close to 2 million of IDPs, and many alleged crimes unaccounted for, the issue of accountability is high on the Ukrainian and international agenda - including on the panel debate organised by the Norwegian Helsinki Committee on 9 June where also the new report "Where did the shells come from: Investigation of cross-border attacks in Eastern Ukraine" was presented for the first time. The report can be downloaded here, or by following the link to the IPHRs homepage. In addition to the military conflict, Ukraine is fighting another crucial war in trying to shake off the legacy of corruption. The reform-minded ministers from the first government have been fired or quit, squeezed out by the old system they are trying to change. President Poroshenko, who promised more openness and transparency, is consolidating the power in his hands, and has appointed two close allies as Prime minister and Prosecutor general. Is there a hope for fair investigation of crimes committed during Euromaidan and the armed conflict in East-Ukraine? And how can national and international contributors, including Norway, work with a flawed and corrupt judiciary system in order to strengthen the rule of law in the country? 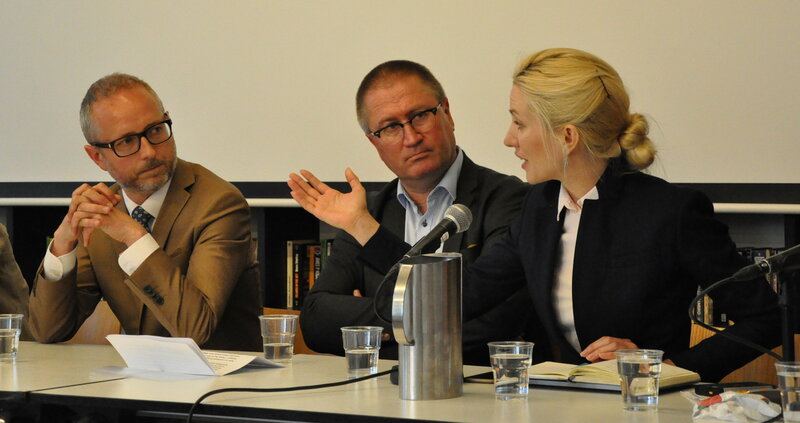 On Thursday 9 June the Norwegian Helsinki Committee organized a panel debate with politicians and human rights activists from Norway and Ukraine, who discussed ways of achieving accountability and democratic reforms with Norwegian politicians. Svitlana Zalischuk, a Ukrainian parliamentarian and a member of the inter-fraction Eurooptimists group, spoke about the political situation and reforms. Despite a large number of truly revolutionary legislative initiatives which has been passed into laws during the last two years, the lack of real political will to implement them is weakening the sentiment of moving forward. Changes towards more transparency in system of state procurement, national registers of businesses and real estate, are starting to bring small but concrete results in fighting the corruption. Other initiatives, such as reform on status of judges or public financing of the political parties, have a potential to be effective if truly enforced on all the levels, while reform of the Prosecutor’s office is, unfortunately, seemingly futile. Svitlana Zalischuk is convinced that although some of those legislative efforts are not currently prevailing, they are irreversible. The reason for her optimism is a fundamental shift within the Ukrainian society itself, which is the generator and a watchdog of those changes. During the seminar, the activist and researcher Svitlana Valko presented a fresh report from International Partnership for Human rights (a Brussels-based organization and partner of the Norwegian Helsinki Committee) on cross-border attacks in the Eastern Ukraine. The report analyses attacks on the villages of Luhansk province (Ukraine) in 2014 and provides evidence of the international character of the conflict (as defined in Article 2 common to the Geneva Conventions of 1949). The report gives evidence of the violations of international humanitarian law and international criminal law perpetrated in the examined area in the summer of 2014. The issue of ICC’s investigation into the crimes committed during the last two years of the military confrontation in the Eastern Ukraine was raised by the senior advisor at the Norwegian Helsinki Committee, Aage Borchgrevink. Based on experience of collecting evidence and advocating for the ICCs involvement in Georgia, Borchgrevink views the chances of ICC opening the Ukraine as likely. The official investigation into the 2008 armed conflict in Georgia, was finally opened this year – a milestone on the road to accountability in the former Soviet region. Another panelist, Tonje Meinich, spoke of the specifics of the Ukrainian judiciary, and provided analysis of the new legislature within the justice system. Meinich is a director of the newly established bilateral NORLAU project (Norwegian Mission of Rule of Law advisers to Ukraine), which is funded by the Norwegian government. The discussion with the Norwegian politicians, Ola Elvestuen (V), Bård Vegar Solhjell (SV) and Geir Jørgen Bekkevold (KrF) on Ukrainian challenges engaged both the panelists and the audience. Amongst other topics, they touched upon the existing mechanisms for achieving accountability after Ukraine experienced annexation of its territory by the Russian Federation and the subsequent aggression in the East. To condense the discussion: keeping focus on the situation with Ukraine’s conflict, economy, corruption and socio-political developments, Norway can contribute to positive change by remaining an active partner for Ukraine in different fora. At the same time, Norway should make the most of available tools like sanctions and the Council of Europe, and not depart from core principles and values.